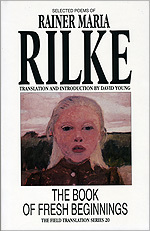 Rilke shows us how poetry made the transition from romanticism and symbolism into true Modernism. This new selection, drawing primarily on his extremely rich middle period in the first decade of the twentieth century, and concluding with a selection from his late Sonnets to Orpheus, offers a clear, powerful, and contemporary Rilke. David Young's versions of the Duino Elegies have captured a significant readership over the last thirty years. He has also translated Gunter Eich, Eugenio Montale, the T'ang dynasty poets, and Miroslav Holub. that's not their own, mirrored from far away. you feel how short the little life has been. a touching blue delights itself in green. Copyright c 1994 by Oberlin College. May not be reproduced without permission.